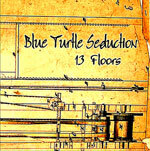 Lake Tahoe's Blue Turtle Seduction's third album contains one absolutely perfect pop song ("Antidote"), another that's almost as good ("Stop Drop and Roll") ... and then the song quality drops precipitously. Still, their reggae- and World Beat-tinged pop rock has a nice beach vibe to it, and even when the songs aren't memorable the band's charisma is. To those two songs: "Antidote" opens slowly with a little noodling figure on twin guitars before the vocals come in with a hypnotic sing-song verse. The mix on the vocal harmonies during the chorus is as lush as an old Turtles or Hollies song, and then Jay Seals lays down a sharp little solo on guitar. In a just world, Casey Kasem is playing this song Saturday mornings for the next couple of months. On almost any other album "Stop Drop and Roll" would be the featured song. Alternating between a reggae verse and a power-pop chorus, the song is anchored by a gorgeous melody. Good luck getting either of these songs out of your head once you've heard them. The rest of the songs tend toward the nondescript, with the band showing they can play Celtic punk ("El Camino") and do a scary imitation of Bertie Higgins' saccharin "Key Largo" ("Castaway").